WARWICK, R.I. (July 17, 2014) – Local businesswoman Lorie Huston, veterinarian and founder of Pet Health Care Gazette, has been named a finalist in Women in the Pet Industry Network’s (WIPIN) annual Pet Industry Woman of the Year Award competition. Huston, who has been a practicing veterinarian for 28 years, was nominated in the Solopreneur category. She and 24 others will now move on to compete within the categories and, finally, for the 2014 Pet Industry Woman of the Year Award. Winners will be announced Aug. 15 at the WIPIN Conference and Awards Show in Portland, Ore.
Award categories include Solopreneur, Entrepreneur, Corporation, Advocate and Rising Star. Five finalists were named in each category. One overall Pet Industry Woman of the Year will be chosen from the 25 finalists. In addition to being recognized during an evening awards ceremony, Huston will also sit on a panel of experts, who will participate in a round table discussion on Friday of the WIPIN conference, which runs Aug.14 through 16 at the Sheraton Airport Hotel in Portland. 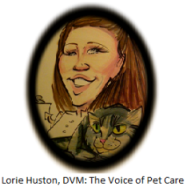 Huston is a practicing veterinarian as well as an award-winning writer and blogger. She has earned the title Certified Veterinary Journalist (CVJ). She is the president of the Cat Writers’ Association. Among her many achievements, Huston is the proud recipient of the 2014 Winn Feline Foundation Media Appreciation Award. Her award winning blog, Pet Health Care Gazette, provides essential and timely pet care and pet health information to all pet owners. More information about Huston is available at Lorie-Huston.com. Acquired in 2012 by Shawna Schuh, the current President and Chief Pet Wrangler, WIPIN is headquartered near Portland, Ore., and serves a worldwide membership base of women in all sectors of the pet industry. WIPIN helpsentrepreneurial women grow their pet-focused businesses through unique networking opportunities, valuable business growth options and online resources. The All About Growth Conference & Awards Show in August will bring women together to connect, network, and learn how to grow their pet-focused businesses.